Based on its analysis of the Yankees draft class, Baseball America seems to be among those who are coming around on top pick Dante Bichette Jr.
(Bichette) got off to a slow start, but his natural timing and bat-to-ball skills took over… The Yankees believe Bichette not only will stay in the infield but will be an asset defensively at third with solid hands, a plus arm and the agility to defend bunts. Baseball America picked college relievers Mark Montgomery (51 strikeouts in 28.1 innings) and Branden Pinder (0.68 WHIP) as players who could move quickly, but the review also noted that Bichette could move faster than most high school hitters. Check out the link for some nuggets on outfielder Jake Cave, power-hitting catcher Greg Bird and the missed opportunity of Sam Stafford. BROOKLYN, N.Y. — Dante Bichette, Jr. has been in the Yankees organization for just a few months now, and has already won a league MVP award and two championship rings. Suffice it to say, the future seems quite bright for the personable 19-year-old, who was drafted in the first round (51st overall) by New York this year. The next in a long line of “future Yankees third basemen,” Bichette may very well jump to the front of that line sooner than you think. 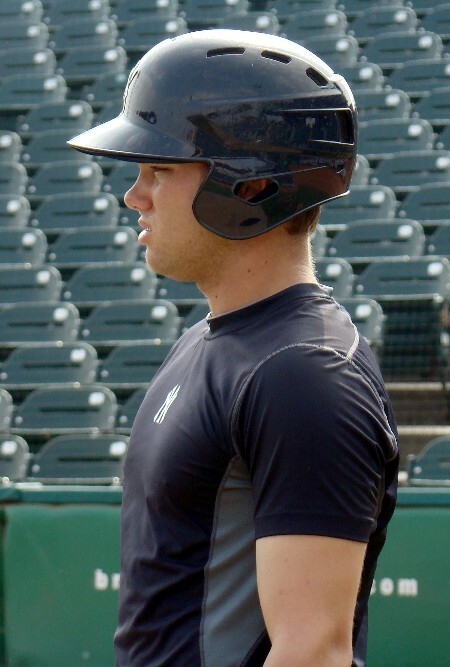 After posting a silly .335/.440/.507/.947 line with four home runs and 48 RBI in 52 games with the Bronx Bombers GCL affiliate and leading them to a championship, he was called up to Short Season-A Staten Island, where he appeared in two games and was shut down prior to their successful postseason. The son of well-known former big leaguer Dante Bichette, the Yankees farmhand will likely start his 2012 season in Low-A Charleston, and it’s not out of the realm of possibility to think he could be calling Waterfront Park home as soon as the following year. But for now, his professional career is just starting out, and I was fortunate enough to catch up with Bichette prior to a Staten Island game in Brooklyn. So, before he gets to the capital city, here’s an interview with the future Trenton Thunder third baseman. Mike Ashmore: Getting selected by the Yankees in the first round, that must have been quite an experience…take me back to that day, what was that like for you? Ashmore: You mentioned that you thought it might be the Yankees…had they been following you for a while in high school? Ashmore: The numbers are impressive, certainly…but how would you describe your experience in the GCL this year? Ashmore: Was it a goal of yours to get to Staten Island at any point in the year or after the GCL season was done, or did that not really cross your mind? Ashmore: What was it like to win a championship in your first pro season? Bichette: “Oh, it was great. It was the greatest feeling that I’ve had on a baseball field ever. Just the feeling of knowing that you’re the last one standing out there on the field, and all the hard work that the whole team put in…coming out on top is great. Ashmore: You mentioned your dad, and I’m sure you’ve been asked 20,000 questions about him…but what kind of influence has he had on you and your career? Ashmore: You’ve played third base coming up this season, is that kind of where you project yourself to end up long term? Bichette: “I’m working real hard at being more agile and all that and playing a good third base. If I keep progressing how I think I’ve been…the coaches don’t seem to mind putting me there, so as long as I keep working, I should be fine. Ashmore: I haven’t seen you play yet, and the majority of the people who are going to read this probably haven’t either. If someone asked you to describe yourself as a player to someone who hasn’t seen you play, how you would do it? Some of you follow the Yankees minor league system very closely, and for you, this is going to be familiar information. For those who don’t pay much attention, we’ll try to provide the nuts and bolts with a level-by-level look at what happened this season, and we’ll start at the top with Triple-A Scranton/Wilkes-Barre. Young pitching was expected to be a strength, and it was The Triple-A Yankees were fourth in the International League with a 3.80 ERA, but their lineup was in the bottom half of the league in runs scored. He strikes out a ton, but there’s no denying the raw power of perhaps the organization’s most unusual prospect. Vazquez is already 29 years old, and he spent most of his career playing in Mexico, but at this point there’s little reason to doubt his ability to hit. His batting average is, well, average. His on-base percentage is disappointing. But the guy hit 32 home runs and 20 doubles in 118 Triple-A games this season. He missed a little bit of time with minor injuries and still finished second in the league in RBI. Honestly, you could make a case for Mitchell, Adam Warren or David Phelps, and truthfully, Mitchell is probably the smallest name of the bunch. He doesn’t have Phelps strikeout stuff, and Warren held hitters to a lower batting average, but Mitchell has ground ball stuff that carried him to 13 wins and a 3.18 ERA through 161.1 innings. A 10th-round pick in 2008, Mitchell would probably standout more if he weren’t in an organization with so much pitching depth. As it is, he’s more than holding his own with bigger names. In the first half, it was closer Kevin Whelan who stood out, but by the end of the season, it was impossible to ignore Kontos. In his first full year back from Tommy John surgery, Kontos fully adapted to the bullpen as a long reliever with a 2.62 ERA, .221 opponents batting average and a little more than a strikeout per inning. The Yankees rewarded Kontos with a 40-man spot and a September call-up. He fell a little bit off the prospect map after the injury, but he’s back on the radar and pitched his way into the big league mix for next season. This is probably the closest Scranton came to a traditional breakout performance. Jordan Parraz had a great year in the outfield, but I’m not sure it changed his status. Lance Pendleton earned a lot of big league time, but he finished year out of the organization. Justin Maxwell was doing big things before he got hurt. Whelan, on the other hand, landed on the 40-man roster by finally improving his control and taking advantage of good stuff that’s always led to low opponents batting averages. Now the question is whether the Yankees were impressed enough to keep Whelan on the 40-man this winter. It might be telling that he didn’t get a September call-up. After last season, and strong first impression this spring, things seemed to be back on track for the former first-round pick. But the wheels fell off again this season. Brackman seemed to fall back into his old rut of high walk totals and erratic production. There is a bright side to his 6.00 ERA: In the second half, Brackman’s ERA was a much-improved 2.35 with a .149 opponents batting average. In his last nine outings — coming immediately after a nine-walk disaster — Brackman had a legitimately good pitching line: 20.1 IP, 11 H, 3 R, 3 ER, 6 BB, 17 K.
There were quite a few prospects on this roster, but obviously none stands out quite like Montero. The Yankees top young hitter finally emerged in the second half and made an impact down the stretch. Overall, it wasn’t the dominant season some predicted — .288/.348/.467 — but he had a good July and a terrific August, and he might be finished with the minor leagues altogether. Of the regular catchers in the league, Montero had the lowest caught stealing percentage at just 20.5 percent. Montero was the only regular catcher below 25 percent and he was well behind league leader Raul Chavez who threw out 47.1 percent of base stealers. Noteable: 3B Brandon Laird took a step back from last year’s breakout season, but still showed some of the power that makes him an intriguing corner man… Two of the true breakout prospect performances this season came from RHP Ivan Nova and RHP Hector Noesi, but they combined for only nine Triple-A appearances because they spent so much time in New York… OF Justin Maxwell spent most of the year on the disabled list, but before he got hurt, he had a .358 on-base percentage and a .588 slugging percentage. He’s still on the 40-man, and given the Yankees lack of upper-level outfield depth, his 48 games do standout a little bit… RHP David Phelps would have led the team in strikeouts with a relatively low walk total if not for a late-season injury. He’s now getting innings down the Arizona Fall League… If he had a spot on the 40-man, OF Jordan Parraz might have won a call-up with his .289/.362/.440 slash line. Truth be told, he outhit both Greg Golson and Chris Dickerson down in Triple-A… This team used 40 different pitchers. Forty! The Yankees Double-A team ranked in the bottom half of the Eastern League in just about every offensive category and had only one player reach double digit home runs. The pitching staff wasn’t much better, and that led to a sub-.500 record. This might have been a breakout season for several Thunder players — Melky Mesa, Brad Suttle and Graham Stoneburner were intriguing for various reasons — but instead it was usual suspects Manny Banuelos and Dellin Betances who had most of the attention most of the year in Trenton (when the team didn’t have a future Hall of Famer at shortstop, that is). Nothing especially overwhelming about Joseph’s season, just a typically solid all-around year for the versatile infielder who was an everyday second baseman this year. Joseph hit .277/.353/.415 and was one of only five players to get into more than 100 games for the Thunder. He led the team with 58 RBI and tied for the league lead with 38 doubles. A fourth-round pick in 2008, Joseph has been a steady hitter while playing second and third base, and should move up to Triple-A next season with an eye on a big league utility role at some point. He had a losing record and pitched only 105.1 innings for Trenton, but Betances still stands out because he led all starters with 115 strikeouts and a .219 opponents batting average. Betances and Banuelos each battled some control problems, a sign that they still have work to do before they’re fully polished, but both showed that they can be dominant. Betances allowed two runs or less in 12 of his 21 Double-A starts. He was better in the first half than in the second half, but more than held his own when given his first big league start in late September. He’s clearly not a finished product, but Betances showed why he’s such a highly touted young arm in the Yankees pitching-rich system. Josh Schmidt and Wilkins Arias delivered typically Double-A impressive numbers, but neither pitched more than 35 innings, and Tim Norton’s incredibly dominant Double-A stint was cut short after just 29 innings. Meanwhile, Venditte threw a whopping 90 innings — all of them out of the pen — and carried a 1.23 WHIP that was the best on the team among anyone with more than 35 innings. Seen as a kind o sideshow, Venditte has gotten results at every level, and this year he held lefties to a .213 average with 43 strikeouts in 136 at-bats. He pitched at least three innings 10 times, and went as high as 4.1 innings (on 57 pitches). As he keeps getting outs at higher and higher levels it’s becoming more and more difficult to completely dismiss him as a legitimate prospect. Trenton’s truly eye-opening performance lasted only the first two months of the season. Coming back from injury, Norton put himself firmly back on the map with 22 exceptional relief outings for the Thunder. He struck out 44 batters in 29 innings, allowed a .124 opponents batting average and earned a promotion to Triple-A. After one outing for Scranton/Wilkes-Barre, Norton landed back on the disabled list and was never heard from again. One of several pieces of the Trenton roster that seemed so close to a breakout but ultimately fizzled for one reason or another. Coming off an MVP season in the Florida State League, Mesa came into this year with a 40-man spot and renewed hope that he might finally turn his exceptional tools — power, speed, defense — into legitimate baseball progress. Instead, he took a step back. Mesa’s strikeout totals went up slightly and his slash line dipped to .251/.329/.404 with nine home runs and 18 stolen bases. In an organization light on elite upper-level outfield prospects, Mesa offered some hope this season, but he didn’t do much to keep the attention. Austin Romine’s power numbers also dipped this season, Brad Suttle did nothing to resurrect his prospect status and Graham Stoneburner was limited to just 11 starts. One of the top left-handed pitching prospects in baseball, Banuelos generated a ton of buzz in spring training, but he had 52 walks in 95.1 innings with Trenton. Only three of his 20 starts lasted more than five innings. But there were, of course, plenty of positives. Banuelos struck out 95, had a 3.59 ERA and held lefties to a .229 average. He was bumped to Triple-A in August and made seven starts at that level, including a seven-inning, one-hit gem against the Red Sox top minor league affiliate. Banuelos had a good-but-not-overwhelming season, showing the promise and the youth of a 20 year old. Notable: C Austin Romine didn’t hit for the same power that he showed last season, but his batting average and on-base percentage both improved in his second Double-A season. He threw out 23.9 percent of base stealers, ranking seventh of nine qualifying catchers in the Eastern League… LHP Shaeffer Hall and RHP Craig Heyer each had 10 wins in solid but not standout seasons out of the rotation… After an impressive 2010 seasons, RHP Graham Stoneburner had a 1.69 ERA through his first three Double-A starts before being shutdown with an injury. He returned in late July, but he’ll ultimately need to take a mulligan on his season… RHP Josh Schmidt first got to Trenton in 2008. In his past three seasons he’s had a 1.61, 2.67 and 1.83 ERA in Double-A, but he’s gotten just 21 opportunities in Triple-A. Such is the life for a soft-tossing right-hander. Have to feel for the guy, though… SS Jose Pirela made a team-high 39 errors, the most among Eastern League shortstops… Nice year for OF Ray Kruml who hit .290 and earned some playing time in Triple-A… Up from High-A Tampa, OF Ziolo Almonto, 3B Robert Lyerly and RHP Chase Whitley were among the biggest names on the roster at the end of the year. With the large number of trade pieces that the Yankees have, how likely is a major trade for the Yankees this off-season? I was thinking about this the other day, and I think the Yankees will definitely need to move somewhat quickly when it comes to dealing with some of their prospects. Guys like Adam Warren, David Phelps, and Hector Noesi aren't getting any younger, and there aren't many open roles on this team right now. They provide excellent depth, as most teams would love to have guys like them that could step in as a 5th starter in the event of an injury. But the older they get, they farther their trade value will fall. If the Yankees make a relatively minor move, seeing any of those guys in a deal would not surprise me. The Yankees have elite prospects in Jesus Montero, Manny Banuelos, Dellin Betances, and Gary Sanchez that could be moved in the right package, but as of now, the market hasn't taken shape and it is difficult to say who will become available. The Yanks have also refused them in deals for good but not great starters, so it would really take someone special to see these guys moved. When the season started, it was the Tampa roster that created the least buzz of any Yankees affiliate. Manny Banuelos and Dellin Betances had moved up to Double-A, Slade Heathcott and Gary Sanchez were still in Low-A, and High-A Tampa was left to a handful of mid-level prospects and unknowns. Of course, it was Tampa that won more games than any other Yankees minor league affiliate, primarily on the strength of a solid lineup and a group of pitchers who weren’t quite overwhelming but held their own. The team’s ERA was near the bottom of the Florida State League, but individually, enough pitchers did well enough to win 74 games, one more than Scranton/Wilkes-Barre and nearly 20 more than more highly touted Charleston. Part of the reason the Tampa roster thrived is that Almonte finally had a breakout season. He played in only 70 games before a promotion to Double-A, but he still led Tampa in home runs, finished second in RBI and put together the team’s most impressive slash line at .293/.368/.514. Signed out of the Dominican Republic way back in 2005, Almonte finally had a decent year in Staten Island in 2009. He was a little bit better last year in Charleston and Tampa, and this year he showed a mix of power and speed before his Double-A promotion. He didn’t do nearly as much with Trenton, and he’ll likely try to avoid following Melky Mesa’s footsteps with a return to Trenton next season. In his last 10 outings, Marshall allowed more then three runs only once and more than two runs only twice. He had a 2.84 ERA through that stretch, finishing the year at his very best, despite the fact he easily surpassed his career-high for innings pitched. In his second year back from Tommy John surgery — a year in which Baseball America ranked him the 11th-best Yankees prospect — Marshall got better as the year progressed. He turns 22 next spring, and should have Double-A in his sights coming out of spring training. Could have gone several ways here — Chase Whitley, Preston Claiborne, Jose Quintana — but I’ll go with the Tampa closer who walked only five guys all year, had more than twice as many ground outs as fly outs, and led the team with a 0.89 WHIP. He was a 47th-round pick in 2008, and he’s certainly not a big name in the system, but that’s a nice year. Looking for the reliever who made the biggest name for himself, that’s probably Whitley, who had a 1.68 ERA, a 1.06 WHIP and earned a Double-A call-up in his first full season. Really, Almonte is probably the best pick here, but I’ll go with an odd pick. Mustelier is a 27-year-old out of Cuba. He’s too old for this level, and he’s in his first year with the Yankees, but he also hit .333/.378/.524 while playing all over the field. It’s only 126 at-bats, but that line makes you take notice, and a guy in Mustelier’s spot needs to make people pay attention quickly. There’s no time to wait a few years for a breakout season. He needed to make a quick impression, and he did, and now he’s playing in the Arizona Fall League (he’s hitting out there as well). The number that matters is the number five, as in five at-bats. The Yankees top pick in 2009 was expected to start the year in Low-A, move fairly quickly to High-A and improve on last year’s so-so numbers. He got off to an incredible start in Low-A, moved up despite a considerable drop in production, and wound up on the disabled list after only one game with Tampa. He didn’t play past the end June. Starter Jairo Heredia also had his season cut short at the end of June, and another starter, Jose Ramirez, struggled in a brief High-A strint, but Heathcott’s injury was one of the biggest blows to the system this year. Aside from Marshall — who’s something of a wild card given the injury history — none of the Yankees elite, big-name prospects spent a lot of time in Tampa this year. Whitley could certainly fit here, but we’ll go with a guy who seems perpetually on the verge of building some legitimate prospect buzz. A converted infielder, Almonte put up season totals perfectly in line with his previous two years, but in the second half he hit .317/.367/.478 with 17 stolen bases and nine triples. The Yankees have to hope it as a sign of things finally coming together, or was it too little, too late? Notable: In no way is SS Walter Ibarra an elite prospect, but he did give the Yankees his best season this year with a .297/.333/.421 slash line and 10 stolen bases… 3B Rob Lyerly hit .315/.363/.462 to earn a promotion to Double-A in the middle of June. The 2009 sixth-rounder hasn’t shown typical corner infield power, but he’s hit and advanced… RHP Scottie Allen, the player the Yankees got from Arizona for Juan Miranda, opened the season in Tampa but went down to Charleston after a 7.21 ERA through 16 appearances. The Charleston numbers were even worse… Mentioned LHP Jose Quintana briefly above, but he did have a terrific year while splitting time between the rotation and bullpen. He had 10 wins, a 2.91 ERA and 1.12 WHIP… Signed as a free agent last year, RHP Josh Romanski had a 3.16 ERA in the Tampa rotation, went to Trenton and had a 2.04 ERA as a reliever… 1B Luke Murton led Tampa with 62 RBI and 28 doubles… OF Deangelo Mack hit .300/.364/.464 to earn a Double-A promotion, while C Kyle Higashioka hit .238/.300/.372 to earn a demotion to Low-A, where his numbers were even worse… Best pitching stats on the team belonged to INF Emerson Landoni who pitched in one game, threw two scoreless innings and got the win. Nick (Connecticut): I was wondering how close Jordan Cote came to any of the rankings in the report card? Love the chats thanks. John Manuel: Most of these categories deal with "now" tools. Cote is a projection guy. The way the Yankees put it to me, they thought that after he went to school for three years in the South (I believe he was committed to Coastal Carolina), he could be a first-rounder, so why wait? They trust their ability to get him moving a little quicker and like his athleticism, body control and projectable frame. Early in the season, when Slade Heathcott and J.R. Murphy were hitting, there was plenty of excitement to go with Charleston’s losing record. Even individual success, though, proved inconsistent and the RiverDogs finished with just 55 wins — only 10 more than short season Staten Island. There must be some expectation of inconsistency at this level, and the Yankees certainly saw that up and down the roster and throughout the season. Charleston was near the middle of the South Atlantic League — but still in the bottom half — in most offensive categories, and it was roughly the same for the pitching staff, which had the league’s second-most strikeouts but also its second-most walks. There were no flawless Hitter of the Year candidates in Charleston this year, and that’s the way it’s supposed to be at this level. The guys who got off to hot starts were gone by mid-season, and the guys who stuck around showed some of the growing pains that come with youth and inexperience. Ultimately, the team’s top prospect was also it’s best overall hitter. Sanchez played in just 82 games — he finished the season on the DL with a broken finger — but he led the team with 17 home runs, 12 of them coming in just 38 games in the second half. A slash line of .256/.335/.485 is far from perfect, but the power stands out, and the guy has yet to turn 19. Only one Charleston starter reached 100 innings this season, and that was Shane Greene, who had a 4.37 ERA and 1.51 WHIP. Instead, I’ll go with Turley, who made just 15 starts before a promotion and a broken hand that ended his season in mid-July. Those 15 starts, though, were terrific. Through 82.1 innings, Turley had 82 strikeouts, 21 walks, a .224 opponents batting average and 1.11 WHIP. His 2.51 ERA would have been the second-lowest in the league had he qualified. Turley’s been getting healthy and seems in line to open next season in Tampa. He’s a bigger prospect than his 50th-round draft selection indicates. Like a lot of pitchers at this level, Kahnle’s walk total was way too high this season — 49 walks in 81 innings — but his 112 strikeouts is outrageous and hard to overlook. Kahnle ranked 13th in the league in strikeouts, and did it without a single start. Opponents hit .223 against him, and right-handers managed just a .205 average. A fifth-round pick in 2010, this was Kahnle’s first full season of pro ball. He was drafted out of college, so it wouldn’t have been out of the question to see him move beyond Low-A this season, but Kahnle showed the potential to be a dominant strikeout pitcher out of the bullpen. For a while it seemed this would be a breakout year for one of Charleston’s top hitters — Slade Heathcott, J.R. Murphy, Ramon Flores, Rob Segedin — but injuries and slow second half performances changed things. Certainly Turley had a breakout season in the Charleston rotation before his promotion. Ultimately, no one burst onto the scene quite like Montgomery, a 11th-round draft pick this year who had 41 strikeouts in 24.1 innings for Charleston. He allowed just 17 hits, only three of which came in his last eight outings (he had 14 strikeouts and three walks in that span). If a breakout season is one that grabs your attention, Montgomery’s certainly fits the description. Back in 2008, De Leon had a nice year in the Dominican Summer League, and the Yankees have spent three years waiting for him to replicate that success in the States. Despite leading Charleston in RBI, De Leon put up another powerful but ultimately disappointing season. He hit 14 homers, but had a .221/.282/.369 slash line. He struck out 147 times, fourth-most in the league. It’s not that there were huge expectations for De Leon, but there was certainly some hope that this might be the year he broke out. Instead he was right with Anderson Feliz and Eduardo Sosa falling short of those hopes. Obviously Sanchez was the top-rated prospect on this team, and Heathcott was close behind, but Murphy entered the year near the bottom of the Top 10 and he some early noise with a .297/.343/.457 slash line in Charleston (he hit .321/.381/.509 in an eye-opening month of May). One of the more intriguing bats in the Yankees system, Murphy was promoted to Tampa in mid-June and had his season cut short by a broken foot in July (just days after a four-hit, four-RBI game). Murphy will have to wait until next year to see if he can build off an encouraging first half. Notable: LF Ramon Flores had more walks than strikeouts in April and a .375 on-base percentage in the first half. In the second half, his batting average and slugging percentage stayed roughly the same, but his on-base dipped to .329. For the year he hit .265/.353/.400 with 11 homers and 13 stolen bases… 3B/LF Rob Segedin hit .323/.396/.482 before a mid-June promotion to Tampa, where his numbers dropped to .245/.311/.309. The third-rounder is currently in the Arizona Fall league… 1B Kyle Roller hit .305/.379/.545 in Charleston and followed that by hitting .265/.365/.427 in Tampa. Not bad for a first full year as a pro… Middle infielders Anderson Feliz, Jose Mojica and Jose Toussen combined for 72 errors and none had an OPS higher than .649… After barely pitching the past three years, RHP Manny Barreda had 82 strikeouts and a .247 opponents batting average in 74 innings out of the bullpen… Last year’s 12th-round pick RHP Dan Burawa jumped from Charleston to Tampa and is wrapping up his year in the Arizona Fall League. Even when I was covering minor league baseball, I found it hard to put too much stock into short season and rookie ball numbers. These guys are a long way from the big leagues, and the game is full of guys who put up numbers in short season and rookie ball, but fizzled long before the majors. That said, first impressions matter, and that’s certainly what these early levels are about. In Staten Island, the Yankees went 45-28 with one of the league’s best lineups and a strong pitching staff. They won the New York-Penn League, making Staten Island the Yankees most successful affiliate this season. The Yankees fourth-round pick in 2010 was arguably their most buzzworthy selection. While top pick Cito Culver was met with doubts, Williams was instantly praised for his high-end ceiling. He played only five games last year, but this season he earned even more believers with a terrific all-around season in Staten Island. He hit .349/.395/.468 with 28 stolen bases and a league-leading 94 hits (10 more than anyone else). He’s a left-handed hitter but actually had more success against lefties than against righties. Next season will be a new sort of challenge as he’ll play his first full season, but already Williams is challenging Slade Heathcott as the team’s top center field prospect. Really, there wasn’t a huge difference between any of Staten Island’s top three starters, but — fair or not — Mitchell is certainly the name that stands out. The Yankees convinced him to sign rather than attend North Carolina, and he was the most highly touted starter on the Staten Island staff. His results improved as he threw more innings later in the year. In his last four starts, Mitchell had a line of 21 IP, 17 H, 3 R, 3 ER, 9 BB and 17 K. He’s far from a finished product, he showed glimpses of his potential. Plucked out of college in this year’s draft, Pinder was Staten Island’s closer and finished second in the league with 14 saves. Opponents hit just .152 against him, and he struck out 38 — with just five walks — in 31 innings. He allowed a total of four runs all year, one of them on a home run in his final appearance of the regular season. In the playoffs, he was 3-for-3 in save opportunities with six strikeouts, one hit and no walks. It was an impressive debut from a 16th rounder. At this level, pretty much every good performance could be considered a breakout performance. Brown stands out because he was a 23rd round pick last year and hit just .234 without much power in the Gulf Coast League last season. This season, he clobbered the New York-Penn League with a .446/.544/.635 slash line, and when he was promoted to Charleston in mid-July he kept hitting (.321/.418/.382 after the promotion). The on-base percentage might not be a fluke. Brown had more walks than strikeouts in the GCL last year, and he did it again at each stop this season. Last year’s first-round pick hit .327/.405/.464 during the month of July, but on the whole, his .250/.323/.337 slash line was uninspiring. The Yankees believe in Culver’s glove and think he’ll be able to stick at shortstop. They also drafted him knowing that he was young with some work to do. The bright side is that Culver hit .324 with a .388 on-base percentage, and obviously that month of July shows that the bat has potential, but those hoping for a huge, breakout season were left wanting more. Williams and Culver were the top prospects on this team, but Gumbs was a second-round pick last year, moved to second base because Culver has claimed shortstop, and hit a solid .264/.332/.406 this season. He hit third quite a bit, showing the Yankees have some faith in his bat, despite the fact he’s a middle infielder. He’s extremely young, and when Baseball America profiled him as the Yankees 25th-best prospect, it noted that Gumbs is seen as a raw, long-term project. Notable: Nice year for RF Ben Gamel, the team’s 10th-round pick last year who hit .289/.373/.432 with good production against both lefties and righties… In a return to Staten Island, UT Casey Stevenson played all four infield positions plus right field and greatly improved on last year’s numbers, hitting .272/.374/.386… 1B Reymond Nunez showed improvement in his second half-season in the States… This year’s 21st-rounder Zachary Wilson was the team’s primary third baseman and hit .256/.346/.457 with a team-high 10 home runs. He also spent some time in the outfield… 3B Tyler Austin continued to hit after a promotion from the Gulf Coast League… Finally healthy enough to pitch, RHP Caleb Cotham had 29 strikeouts in 21 innings for Staten Island. Chase Whitley: The Yanks 15th rounder in 2010 out of Troy State, Whitley is a big 6’4” 220 right-hander with a nasty repertoire. He throws a four seamer which touches 96 and has a very late rise, just enough where he will miss a lot of barrels. He throws an 85 or so slider, and while the break isn’t big, it’s late, which, in the overall scheme of things is almost a preferred option because the potential of a mistake is less. He has a nice change in the 83, 84 range and consistently keeps it down in the zone. At the time of the draft, Whitley was considered to have the best changeup of any college pitcher, and that fact proved to be true yesterday, albeit in just one inning of work. As a pro, Whitely’ made just one start in 72 career appearances, and that was an emergency start this year in Trenton when the scheduled starter cramped up in the bullpen warming up. Whitely didn’t take up pitching until his junior (draft) year of college and spent most of his early development years as an offensive player. The fact he was able to develop a plus changeup, arguably the most difficult pitch to master, in such a short time points to him being able to learn and master his slider, and if what I saw yesterday is an indication, he’s well on his way to accomplishing that. Despite his current career path as a reliever, the Yankees like his future potential as a starter and could have him repeat Trenton next year as a member of the rotation. If that doesn’t work out, and if David Robertson ends up the in-house replacement for Mariano Rivera, Whitely has the stuff to step into the set-up role down the road, and could potentially close as well. That’s some pretty high praise for Whitley. I’ve always been unsure of what to think about him. The Yankees certainly seem to be easing him into starting pitching. He pitched a total of 91 innings in 2011 in just 42 appearances, and will get additional work done in Arizona. They would probably be comfortable allowing him to throw 130 or so innings next season. But for now he’s still in the bullpen, and has been aggressively promoted to Double-A. His 2011 K/BB rates weren’t too impressive (7.6 K/9, 2.9 BB/9) given his great stuff. The three pitch arsenal sounds great, but as a starting pitcher he is going to have to reel his control in to avoid becoming a right-handed Wilkins De La Rosa. Its a good scouting report, but Chase Whitley has always had a great scouting report. That’s why he was converted in the first place. I’d just urge caution about too much optimism.